Aatrix Software updates forms throughout the year. If the computer that has Aatrix installed does not have Internet access, quarterly updates can be downloaded from a computer with Internet access, and then transferred to the computer without Internet access. 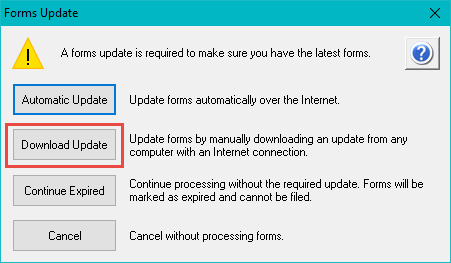 To do this, click on the Download Update option in the Forms Update screen when opening a form.